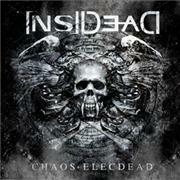 It has taken INSIDEAD 13 years to come up with their debut album. The Greek-Swedish combo, founding member and bass player Nick M was born and raised in Sweden, has played a lot live, won the Wacken Metal Battle in 2009, and managed to get sponsored by the likes of Schecter and Mapex. It sounds odd to me that their first demo was released as late as 2008. Mixing and mastering was done by RD Liapakis at Prophecy and Music Factory Studio, so I expect something from this band. The barrage of riffs in “No I.D.” feels like a great choice for an interesting opener. The song is quite straightforward and sports an interesting refrain. Unfortunately that track, plus the equally relatively simple and melodic “Time”, and, to some extent, the Hetfield-clone “In My World” are the ones that holds water. Those and the production work. The rest of the songs are plagued by too modern thrash, or what to call it, blurred arrangements, boring churning riffs, which are also far too repetitive. The occasional voice distortion doesn´t do them any good, and it all reminds me of FLOTSAM & JETSAMS worst albums. They didn´t work out either… I sure hope there are people out there who like this more than me. Or else we´ll have more contributions to the Greek financial situation soon.